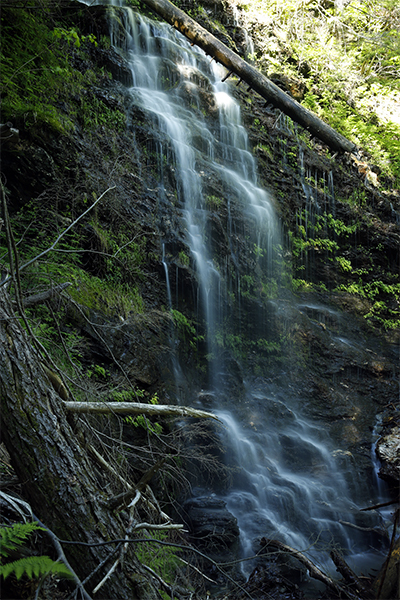 Deer Hill Falls is one of several highly seasonal, low-volume waterfalls found in Mt. Greylock State Reservation. I've been to these falls four or five times, and they usually look like a thousand dripping faucets. From March through May, the falls are much more substantial, showing off full curtains of whitewater. Spring runoff provides the optimal time to view the falls in their finest form. This presents a challenge, however, as the state park road to the trailhead is typically opened to vehicles in late-May. If you have the flexibility, try to visit as soon as the state park opens the auto road. 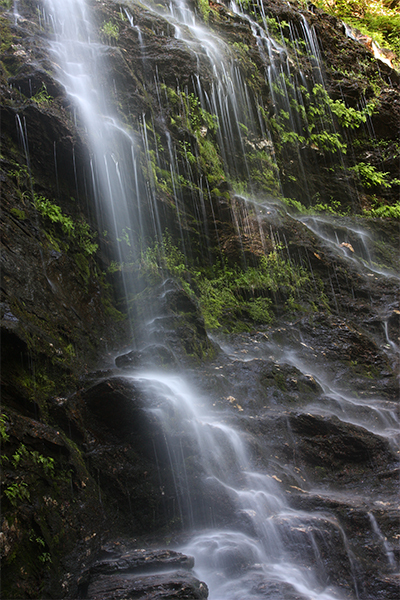 Most hikers who visit Deer Hill Falls also supplement their hike by visiting nearby March Cataract Falls. From the parking area on Rockwell Rd, cross the road and continue on foot down Sperry Rd for 0.6 mile until you reach a small ranger station and a fork in the road. To reach March Cataract Falls, you would want to fork right and follow signs 0.8 mile to those falls. To reach Deer Hill Falls, take the left fork. In 200 feet, take a left and walk past a few campsites and pit toilets, all the while following signs towards the Deer Hill Trail. After walking a few hundred feet, bear right onto the blue-blazed Deer Hill Trail and cross a wooden bridge. In 40 feet, you need to fork right at the next junction and continue hiking for about 0.2 mile. You will then reach another fork. Fork left and follow the Deer Hill Trail as it descends steeply and with rough footing down to the base of the falls. Exploration around the base of the falls is limited due to unstable shale rock. Starting from the campground on Sperry Rd, there are signs at all significant trail junctions to help guide you in the right direction towards the falls. From Pittsfield, take US-7 north. Continue traveling along US-7 north for 3.1 miles past the “Entering Lanesborough" town line sign and take a right onto North Main St. Follow North Main St for 0.7 mile and bear right at a fork onto Rockwell Rd, marked only by a sign for “State Reservation.” Follow Rockwell Rd towards the summit of Mt. Greylock for 6.6 miles (bearing left after 0.4 mile to stay on this road) and park at the Sperry Rd Trailhead on the right, directly across from the start of Sperry Rd. Sperry Rd is 2.3 miles south of the summit parking area for Mt. Greylock and it is closed to unauthorized vehicles. You can also approach the Sperry Rd trailhead from North Adams by taking Notch Rd south from MA 2. When you reach a junction with a spur road that leads to the summit of Mt. Greylock, turn right and continue south on Rockwell Rd as it descends for 1.5 miles to the Sperry Rd Trailhead on the left. Take note that the Sperry Rd Trailhead is for day-use only. If your plan is to backpack into the Sperry Campground near the falls, you will need to park at a separate trailhead that is 0.7 mile south of the Sperry Rd Trailhead. From that trailhead, which is also on Rockwell Rd, you can follow a series of trails to the campground instead of simply just walking down Sperry Rd.